Search for all "Neuregulin 1"
Rabbit anti Human, Mouse, Rat Neuregulin 1. 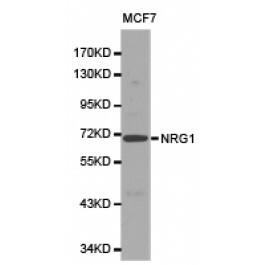 Recombinant protein of human NRG1. Heregulin (HRG), also called neuregulin (NRG1), neu differentiation factor (NDF) or glial growth factor-2 (GGF-2), is a soluble growth factor synthesized as a transmembrane precursor molecule. Metalloproteises and other proteases catalyze the cleavage of its extracellular domain which is then released and functions as a ligand for ErbB3 and ErbB4 receptor tyrosine kise. The sigling pathways of HRG-ErbB3/ErbB4 are involved in regulation of cell proliferation, differentiation, invasion, and survival of both normal and malignt tissues. Abnormality of HRG-ErbB sigling leads to development of a variety of human diseases.HRG family has four isoforms including HRG-1, -2, -3 and -4, which are derived from altertive exon splicing. Moreover, they showed various tissue expression and biological activities. Store at -20C or -80C. Avoid freeze / thaw cycles. Buffer: PBS with 0.02% sodium azide, 50% glycerol, pH7.3.